Extreme Masonry: (Extreme Feats of Masonry from Around the Ancient World). The myth of a primitive society of megalithic builders is being gradually dispelled by discoveries from various disciplines. Apart from the self-imposed extremes associated with transporting and fitting stones weighing several hundred tons each in place, the megaliths, pyramids and other prehistoric structures are examples of a human relationship with stone and offer a glimpse into the mind of the builders, through which we can see a common human potential to conceive, engineer, and create the most unique, and majestic structures possible several thousand years in the past. Extreme Megaliths: Why so large...? The Architecture of the Giza Complex. Building With Large Stones: (Megaliths). The word Megalith derives from the Greek 'Mega' meaning large and 'Lithos' and 'stone'. 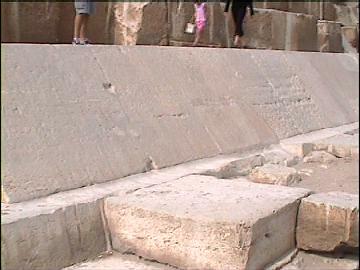 Using large stones is one thing, but when on comes across examples of stones being moved weighing hundreds of tonnes when smaller stones would have been far more ergonomically efficient (such as the three 'foundation' stones at Baalbek), it becomes clear that the size of the stone itself was a consideration in the process of construction. The use of enormous stones such as those seen at Baalbek, Giza, Stonehenge, Carnac, Jerusalem etc etc, reveal a level of organisation and skill that has (naturally) reduced people to debate in the past. Ba'albek: One of the largest carved stones ever, weighing over 1000 tons, was left unfinished by the constructors in the quarry. The technical abilities of the builders of the Ba'albek platform are equally matched by their engineering confidence which required them next to manoeuvre the stones uphill and fit them seamlessly into place. The associated difficulties of such a labour provide an insight into the builders confidence, conviction and ability. The use of large stones is repeated again and again all over the ancient world, leading one to ask: Why ? The most common suggestion is that larger stones provide structures with increased stability and durability, which of course is true, but the excessive size of some stones when balanced against the additional time, effort and manpower suggest that other factors may have been involved. Mendelssohn (11) suggested that the purpose of building fantastically large structures (such as the early-dynastic pyramids of Egypt) was simply to unite the people through a common purpose, at the same time as reinforcing the social hierarchy of 'Kingship'. Extending this theory, one could say that if the size of the monument reflects the greatness of the builder, then the size (and type) of stone in turn, reflects the greatness of the masons. The confidence of the megalithic builders worldwide to work with such unnecessarily large stones is surpassed only by their determination to transport specifically selected stones over vast distances to previously selected sites. Long-distance Megaliths: 'Pieces of Places'. There are some extraordinary accounts of unfeasibly large stones being moved over unnecessarily long distances, suggesting that either the location or the stone itself were considered to have special properties. Stonehenge: Over 80 Bluestones moved over 250 miles from Preseli, Wales. Giza: 50+ ton Granite stones transported over 300 miles from Aswan. Carnac: 300+ ton Lochmariaquer menhirs transported over 25 miles. Ollantaytambo: 50+ ton Porphyry stones transported 7-miles over 6000m high mountains and valleys. But what does this tell us, any more than that they wanted stone from one place to be taken to another ? In each case there must have been a large and available work-force including skilled and un-skilled labourers, support, organisers, all presumably under the authority of an individual or caste. Such structures can be deemed as 'social constructions', and lend weight to Mendelssohn's theory of large monuments/stones as symbols of 'greatness'. Assuming one of the prerequisites of construction being the use of large stones, why then select to move such large blocks of stone over such long distances when other more local and readily available sources were known - as was the case at Stonehenge ? 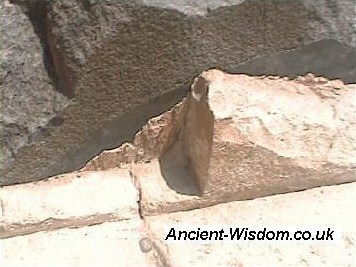 Although it is arguably obvious that the granite used in the Egyptian pyramids was structural, the same cannot be said of all sites, noticeably the 90²ft Mica sheets at Teotihuacán which were found sandwiched between stone layers of stone and which served no apparent structural or aesthetic function. The logistic difficulties involved with long-distance transportation suggests that the stone itself was considered to have qualities worth transporting it over such extreme distances. However, the very fact that stones were transported so far also suggests that the new location itself must have been of equal importance to the builders. The type/location of stone was more important than the extra labour incurred transporting it. The location of the monument was more important than extra work required to move the stone. 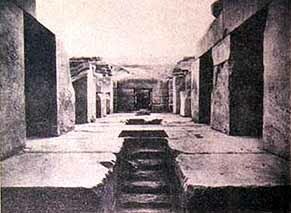 It is interesting to note that one of common factors of these 'long-haul' megaliths is that they were invariably composed of granite (quartzite), which was the leading choice of stone around the prehistoric world, noticeably in areas such as Neolithic Europe, Early-dynastic Egypt and Pre-Columbian America. This prejudice to quarry, cut and haul one of the hardest family of rocks, in cases over hundreds of miles whilst ignoring more locally available sources is a clear suggestion that the qualities of the granite itself were important to the megalithic builders. Firstly, a description of the act of raising a large stone, which is a comparatively easy task. 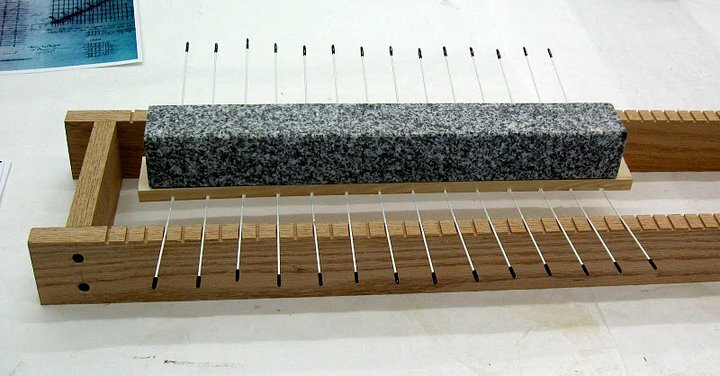 In the picture below, a crib of logs is progressively inserted under the stone as it is raised by levers on either side. 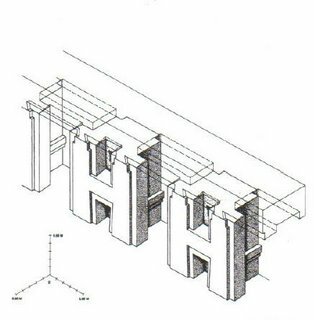 When the levers have reached a height that causes difficulty for the operators, provide the operators with a platform on which to work that rises as the stone rises. This method has been tried and tested by archaeologists with success. 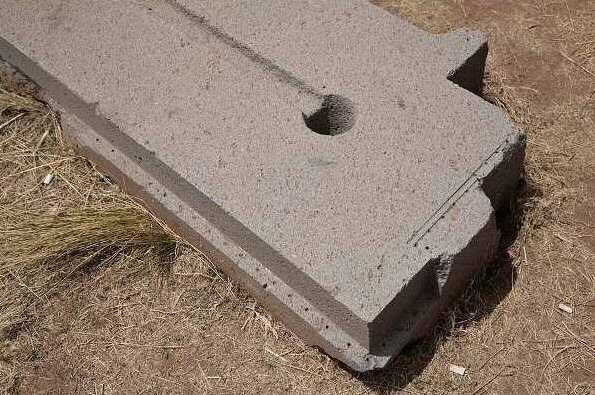 The method for raising a large stone. Having decided upon which stone to work with, it next fell upon the prehistoric masons to move the stone from the quarry to its final resting place. While we know already that stones as heavy as 1000 tons were being moved in prehistory, these are the more exceptional cases. There are however, numerous cases of stones exceeding 100 tones from all around the ancient world and there are several descriptions and images to show us how such stones were moved. 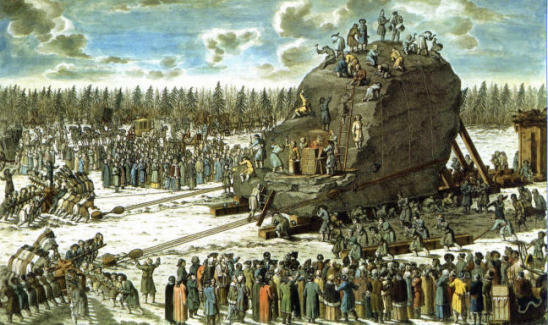 The largest stone ever (recently) recorded to have been moved purely by human power alone is the famous 'Thunder Stone' from Russia, which was moved to St. Petersburg from the gulf of Finland. It was rolled along on small balls placed on a track (Only 100m in length) at a rate of 150m per day. 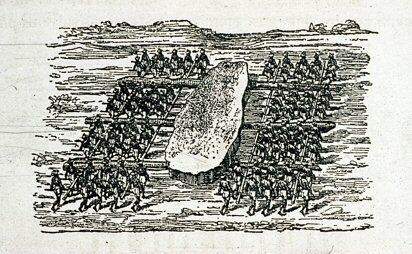 The transportation of the 1500 ton 'Thunder-stone' in 1770 proves that human manpower alone can be employed to move such heavy objects. 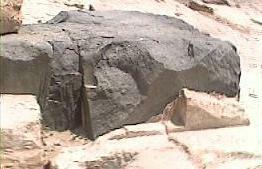 In Egypt, the moving of large stones has a tradition dating back to the early dynasties. The heaviest known blocks to be brought from Aswan to Giza were the massive granite stones used for the roof of the King's Chamber in the pyramid of Kufu. Each weighed between 50 and 70 tons and several 5th and 6th Dynasty pyramids included gabled roofs with blocks weighing up to 90 tons. 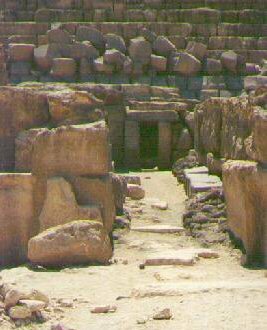 There are also examples at Giza (see below) of limestone blocks weighing as much as 200 and 400 tons. In the 18th Dynasty, two colossal statues of Amenhotep III (the "Colossi of Memnon"), each weighing more than 700 tons, were moved an overland distance of 700 km. Fragments of statues in the Ramesseum (built under Ramesses II) suggest an original weight of around 1,000 tons. Moving a statue in 12th Dynasty Egypt. An ancient method for moving heavy weights has been revived and demonstrated in the field by Prof. J. Cunningham of Skidmore College, USA. Following a system which relies on little more than long, flexible poles of wood, we are shown how it is possible to move otherwise apparently impossibly sized stones. Ref: "Techniques of pyramid-building in Egypt" Nature Vol 332 March 1988. Pole systems such as the one on the right (From India) illustrate the simple method whereby enough manpower can be employed to move large stones. Modern-day Experiments to Move large Stones. 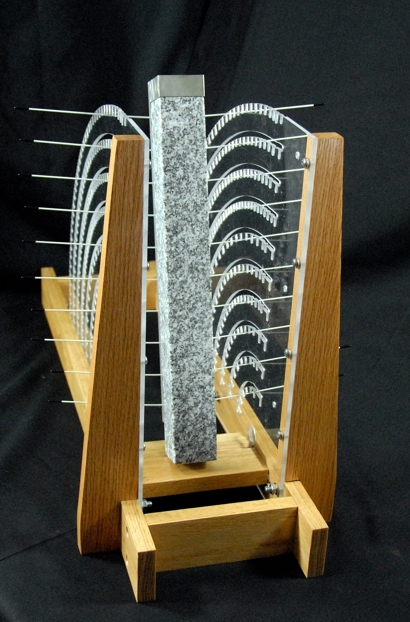 In the demonstrative model above, Prof. Cunningham's theoretical work on moving large objects shows that in theory, at least, using his pole system, a single person should be capable of moving incredibly heavy stones. 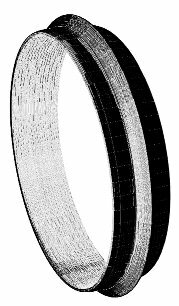 Prof. Cunningham has designed a means of elevating an obelisk using the same process of flexible poles. View Prof. Cunningham's Facebook entry: http://www.facebook.com/walk like an Egyptian. It is not surprising that the occasional eyebrow is raised when we are confidently informed that the Egyptian pyramids, the last remaining 'Seven Wonders' of the ancient world, were constructed by people from the 'Neolithic' period. Apart from the fact that eight largest Early dynastic 'Memphite' pyramids are believed to have all been constructed in under 60 years (11), we are faced with numerous traces of applied mathematics, science and technology within structures that have no apparent precedent in pre-dynastic Egyptian culture. Numerous impressive facts are regularly quoted concerning the astonishing engineering challenges involved in the construction of the 'Great pyramid' of Giza, in Egypt, such as the estimated 2 million blocks with an average weight of 2.5 tonnes which were used to build this pyramid alone. However, there are several other masonry feats at Giza that are equally astonishing. 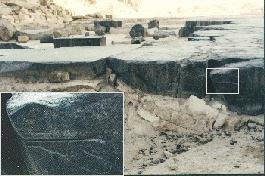 It is often forgotten that before the pyramids were built, the limestone plateau beneath was levelled to an 'optical level of accuracy' (8), over which was placed a platform of carefully cut limestone paving-slabs which can still be seen to protrude from underneath the pyramids base (Photo, left). This platform is around 0.5m thick and despite the passing of time and several earthquakes, remains level to within 0.8 of an inch (21mm) over a distance of over 13 acres (5). The whole complex was carefully orientated to the cardinal directions. The deviation of the Great Pyramid from true North is: 2′ 28", South – 1′ 58", East – 5′ 30" and West – 2′ 30". The seamless joins between the basalt and the limestone pavements. The largest stone at Giza is estimated to weigh as much as 468 tons (5), and can be seen in the wall of the temple east of the second pyramid (Khafre's). 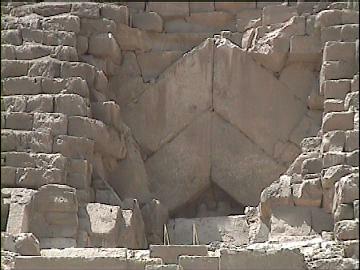 Other limestone blocks weighing 200 tons can be seen in the wall of the Valley temple, next to the Sphinx. 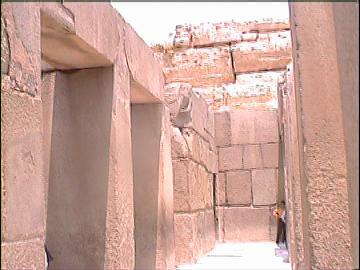 Temple East of 'Khafres' Pyramid. 'Largest stone estimated 468 ton block' (11). (J. Cook; The Pyramids of Giza; p. 22). 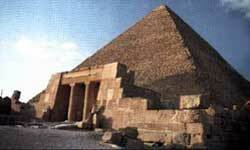 - 'Khafre foundation stones > 400 tons'. Mortuary temple of Menkaure (Mycerinus). 'Reisner estimated that some of the blocks of local stone in the walls of the mortuary temple weighed as much as 220 tons, while the heaviest granite ashlars imported from Aswan weighed more than 30 tons'. The 'Valley Temple' - The Valley temple was built from huge granite blocks in the style of the Osireion at Abydoss. They are estimated at around 50 tons + each. The whole temple in turn was encased in even larger limestone blocks, the largest of which has been (enthusiastically) estimated at around 200 tons. The 'Great' pyramid of Khufu - The 'Kings chamber' in the Great pyramid is covered over with several granite stones estimated at 50-70 tons each. The Gable stones over the entrance (left) and several of the stones covering the descending passage are also several cubic metres in size. Although no large contemporary tools have been found at Giza, the 'saw' marks above, along with others on the 'King's coffer' leave us with the clear conclusion that the early-dynastic Egyptians were using tools tipped with precious or semi-precious stones. This idea is borne out by numerous discoveries of partially finished stone vases which have been 'core-drilled', also requiring the use of blades tipped with a harder stone. The use of core-drilling can be seen on the largest blocks of stone such as the 'king's coffer' in the 'Great' pyramid at Giza, as first noted by Petrie, down to the smallest ornamental trinkets (right), and the apparently 'mass-produced' stone vases, frequently carved from hard stones such as granite and obsidian. The early-dynastic masons were so accomplished at their art that there have been several claims that not only were they 'machining' stone with the use of the lathe and specialised drilling equipment, but that they also had 'high-speed' and 'high-pressure' tools. 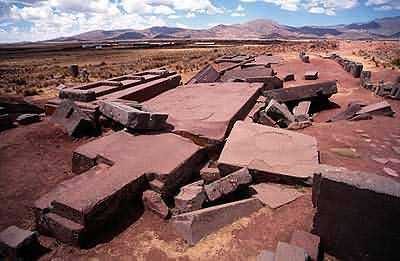 The photos below are the remains of an ancient structure nearby Tiahuanaco known as the Puma-Punka, which is littered with giant, precisely shaped blocks, many of which appear machine made. 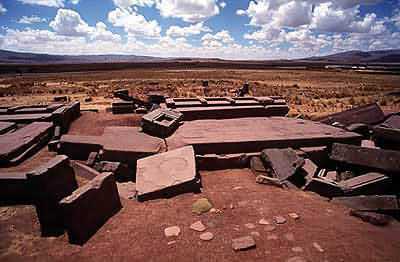 The port of Tiahuanaco, called Puma Punku or "Door of the Puma," which appears to have once been a wharf with a massive four-part building, is now an area filled with enormous stone blocks scattered around the ground like matchsticks, with several weighing between 100 and 150 tons. One block still in place is frequently estimated to weigh 440 tons. The regularly spaced drill marks on this rock are suggestive of drilled pilot-holes, which appear to have also been used to assist in splitting the rocks. 'Oldest Obsidian Bracelet Reveals Amazing Craftsman's Skills in the Eighth Millennium BC'. 'Researchers have recently analysed the oldest obsidian bracelet ever identified, discovered in the 1990's. Dated to 7,500 BC, the obsidian bracelet is unique. 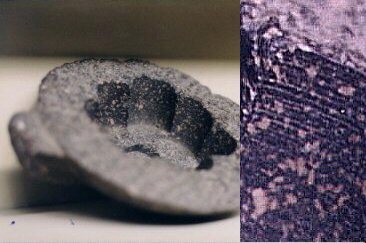 It is not only the earliest evidence of obsidian working, but it has a complex shape and a remarkable central annular ridge, is 10cm in diameter and 3.3cm wide. The bracelet is the first object to have been studied among some sixty other polished obsidian (and agate) artefacts from the same period. 1). David. D. Zink. The Ancient Stones Speak. 1979. Musson Book Co.
2). Cesar Paternosto. The Stone and the Thread. 1989. University of Texas Press. 3). G. Hancock. Heaven's Mirror. 1998. Michael Joseph Publ. 4). J. N .Lockyer. The Dawn of Astronomy. 1964, M.I.T. Press. 6). A. Service & J. Bradbery. Megaliths and their Mysteries. 1979. Macmillan. 7). D. Trump and D. Cilia. Malta: Prehistory and Temples. 2004. Midsea Books. 8). Petrie as quoted by Smyth, Our inheritance in the Great Pyramid, 1890 Ed, pp20. 9). C. Dunn. The Giza Power Plant. 1998. 10). 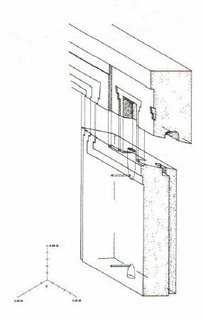 Kalb, Philine, Megalith-building, stone transport and territorial markers; evidence from Vale de Rodrigo, Evora, south Portugal. Antiquity. Sept 1, 1996. 11). Kurt Mendelssohn. The Riddle of the Pyramids. 1974. Book Club Associates.